Our patients come from all walks of life. The majority live in one of the surrounding villages and walk to the clinic, sometimes traveling for three hours on foot carrying a baby. Some may ride a bicycle. Some patients are as far away as a full day train ride. They don't come for the small things... either the pain has become intolerable or the condition has worsened so dramatically that they have no other recourse. The Indian people are strong, with a traditional acceptance of their place in life-- you don't hear them whining or complaining; they deal with what they have been given, with the dharma that is part of their Hinduism. 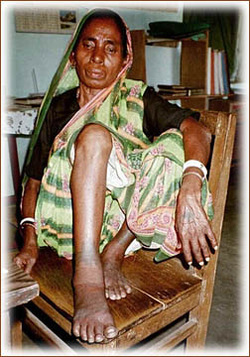 Patients come to us with the widest range of ailments possible: Conditions include headaches, backaches, joint pain, all-over pain, insomnia, learning disabilities, polio, energy deficiencies, chronic/acute diarrhea, infertility, vaginal prolapse from excessive childbirth, chronic malnutrition that seems to be generations old, skin rashes and leprosy. In Traditional Chinese Medical terms, we see much in the way of wind heat, cold wind, depending on the season, excess and deficiencies of Qi and blood, liver fire flaring upwards to no fire at all. Spleen deficiences affecting digestion, phelgm, and blood also affect the heart. There are days in the clinic when I feel we should be feeding every patient; there are other times when the cases of stroke, heart attack, untreated diabetes require immediate emergency western techniques. Our approach is a holistic gathering of all the information and treatments needed to improve the quality of the patient's health.